Hey Suns (is that weird? I kinda like it) This is just a quick post, that turned out to be kinda long, about the products I have been obsessing about lately! Oh and happy first day of school! I first learned about this stuff from my little sister and when I was at Short Pump Mall the other day I couldn’t resist picking some up. 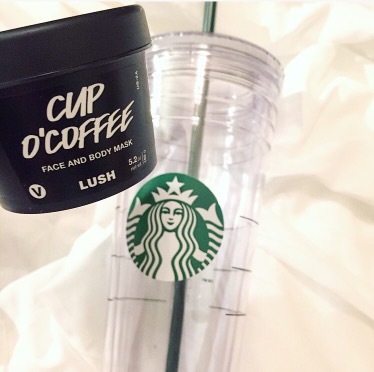 The product has coffee grinds, coffee infusion, agave syrup and other moisturising additives included, so it does a great job of exfoliation and moisturizing ! The grinds allow for the exfoliation to occur and of course coffee is a stimulant too, so it helps the skin perk up a little bit. This is my first Lush product, and I only bought it because #coffee but it has definitely proved its worth! Y’all, i’m probably the most obsessed with these! I got mine on sale at Old Navy and they are definetly my favorite purchase of the summer. They are so easy to wear because you can literally just throw them on with a T-shirt underneath and a cute sandal and you’re set! I’m really excited for the weather to cool off so I can wear them with a long sleeve and some booties! My mom is the kind to send me daily emails with the next thing that could possibly cause cancer, but this particular issue really stuck with me. There is a lot of research about aluminum in deodorant and the dangers it can cause. So, I started using TOMS natural and aluminum free deodorant. It’s such an easy change, and I love the scent, so why not? I also recently started using a DivaCup, so if you’re interested in my opinions on that feel free to get in contact with me! Y’all know I have been saving my money for those gorgeous Anthropologie leggings and Poshmark is helping me get there! Poshmark is an app that allows you to sell clothes online and its v easy! They do take percentage of your earnings, but they also pay for shipping so to me it evens out. So far, I have sold 4 items and made a total of $75, aka I am hella close to my $100 goal. Now that this purchase is becoming a little more realistic, I’m having a hard time deciding between these anthro leggings or a pair of align crop leggings from Lululemon. The anthro ones are gorgeous, but the Lulu ones I could wear more often and they are the most comfy pants to ever grace your body. Comment below which one you think I should get?! I hope you enjoy some of the things that are making my life a little brighter, and let me know if you decide to try any of them, or already have! Oh! I am going to need to check out PoshMark! Thanks for the tip!